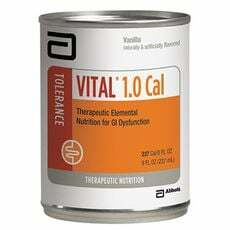 You are buying Abbott Vital 1.0 Cal Therapeutic Elemental Nutrition 1000ml Each, model #62711. ADW Diabetes offers a complete line of enteral feeding supplements for both children and adults. The Abbott Vital 1.0 Cal Therapeutic Elemental Nutrition 1000ml is designed to meet the special needs of patients with malabsorption, maldigestion, and other impaired gastrointestinal functions. Vital 1.0 Cal and Vital 1.5 Cal support excellent GI tolerance and absorption for adults. Vital AF 1.2 Cal provides an advanced formula with ingredients to help adults manage inflammation and promote GI tolerance. Vital products have an ingredient profile that includes structured lipid; 100% hydrolyzed, whey-dominant, peptide-based protein; NutraFlora scFOS; and elevated levels of vitamins C and E. Vital formulations are available for oral or tube feeding. VITAL 1.0 CAL is a peptide-based elemental formula for patients experiencing malabsorption, maldigestion, or impaired GI function and/or symptoms of GI intolerance. Can be used for supplemental or sole-source nurtition. For use under medical supervision. Advanced blend of hydrolyzed protein, structured lipid, and prebiotic (NutraFlora scFOS) to support absorption and tolerance. Meets or exceeds 100% of the RDI for 24 essential vitamins and minerals in 1422 Cal (1422 mL). Water, Maltodextrin, Whey Protein Hydrolysate, Structured Lipid (Interesterified Canola Oil & Medium Chain Triglycerides), Sugar (Sucrose), Partially Hydrolyzed Sodium Caseinate, Canola Oil, Medium-Chain Triglycerides, Short-Chain Fructooligosaccharides, Natural & Artificial Flavors, DATEM, Magnesium Phosphate, Calcium Carbonate, Potassium Citrate, Sodium Phosphate, Potassium Chloride, Cellulose Gel, Ascorbic Acid, Choline Chloride, Calcium Phosphate, Sodium Citrate, Carrageenan, Sucralose, Magnesium Chloride, Cellulose Gum, L-Carnitine, Taurine, d-Alpha-Tocopheryl Acetate, Zinc Sulfate, Ferrous Sulfate, Niacinamide, Calcium Pantothenate, Manganese Sulfate, Cupric Sulfate, Thiamine Chloride Hydrochloride, Pyridoxine Hydrochloride, Riboflavin, Vitamin A Palmitate, Folic Acid, Biotin, Chromium Chloride, Sodium Molybdate, Potassium Iodide, Sodium Selenate, Cyanocobalamin, Phylloquinone, and Vitamin D3.